Experts advise that the study space is always the same, that it preferably has natural lighting and ventilation, that it is equipped with the appropriate furniture and that it is a quiet place away from distractions. In today’s homes, with its shortage of square meters, achieving these goals is not always easy. Next, we have compiled 11 solutions to create a complete study area for your children. The workday of our children and young people does not end in school as they usually have to spend a few more hours at home doing homework. In order for this task to develop satisfactorily, we parents must provide our children with a specially conditioned environment for study, which helps them to concentrate and in which they feel comfortable. Let’s see some practical and original tips to get it. One of the factors that most influences concentration is having adequate lighting. An excess or defect of this will have a negative impact on the students, causing fatigue and vision problems in the future. Experts advise taking full advantage of natural light, which always offers a higher quality than artificial, allowing us to enjoy a greater chromatic range of everything that surrounds us. It is beneficial for the body and provides energy and vitality, in addition to a considerable saving on the bill. Depending on the location of the solar light source in the room, you can arrange the study table below it, perpendicular or even parallel as in this proposal. The study space must be equipped with furniture that allows the student to adopt a correct posture and have at hand all the tools he needs. This basic furniture consists of a large table (with a bottom of 70 cm minimum), an ergonomic chair (adjusted to your height and the height of the table to avoid future injuries to the back), as well as auxiliary elements for storage of books and stationery (shelves, drawers). Do not waste a minute and have all the material in sight, what better solution than to take advantage of the front of the study table with a perforated board. In addition to pegboards like the one in the previous image, you can cover the walls of the study area with blackboards, corks. An element that will help students to have on hand all the information they need (schedules, notices, dates of exams) and that aesthetically can be used as an additional compositional resource. Another requirement of a good study space is that it is isolated from distractions. But that does not mean that we should condemn this area to a sad and anodyne decoration. An original design of the work environment will convey the idea that studying is also fun. Current homes continually pose challenges when it comes to making the most of their small square meters. A very simple idea is to take advantage of the closets to create corners of work in them. This solution will allow you to occupy an extra space only during the time in which you are studying and will help you to have everything collected when this activity ends. Resources as simple as painting colors can transform these niches into cozy desks. 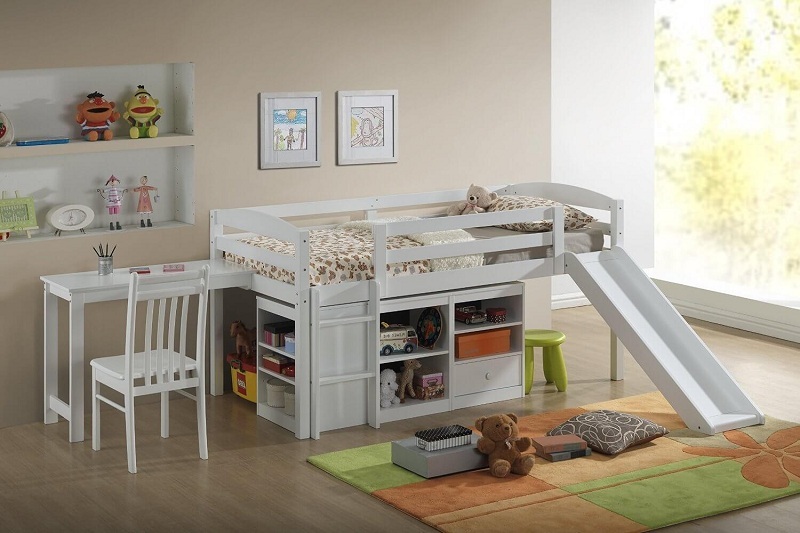 If your child’s bedroom is not very large on the surface but instead has a generous height, do not hesitate to use it to distribute the different uses. Study well the location of the light inputs, the total height and the access possibilities since it will be what conditions where to place the different levels, the rest areas, work, storage, etc. If you can take advantage to put a slide, like the one in this proposal, it will seem most fun. The folding elements that appear and disappear or endowed with wheels and mechanisms that allow their movement is a classic of children and youth furniture. Nowadays you can find designs on the market with this type of systems that will allow your children to enjoy a greater amplitude and versatility in their bedroom when they are not studying. A bed like this, whose headboard becomes a desk where giving the last review before bed is not a conventional solution, but it may be the one that best suits your home and your family. The years go by and, before you know it, children who have been slacking off to go to school will have started going to college. Take into account this from the beginning and plan the furniture for your study area so that it adapts to the different stages without having to make a very large financial outlay. If the majority of your children are still in primary school and their duties do not require excessive concentration, you can opt for a large shared study table in front of the classic desk leaning against the wall. In this case, the dining room table has been chosen for it. If the bedrooms in your home are very small and it is difficult to set up a study or work area, why do not you opt for a common space where children and adults can enrich each other by performing their respective tasks? Enables a corner in the kitchen with furniture of its dimensions, which in addition to study area also serves to eat. 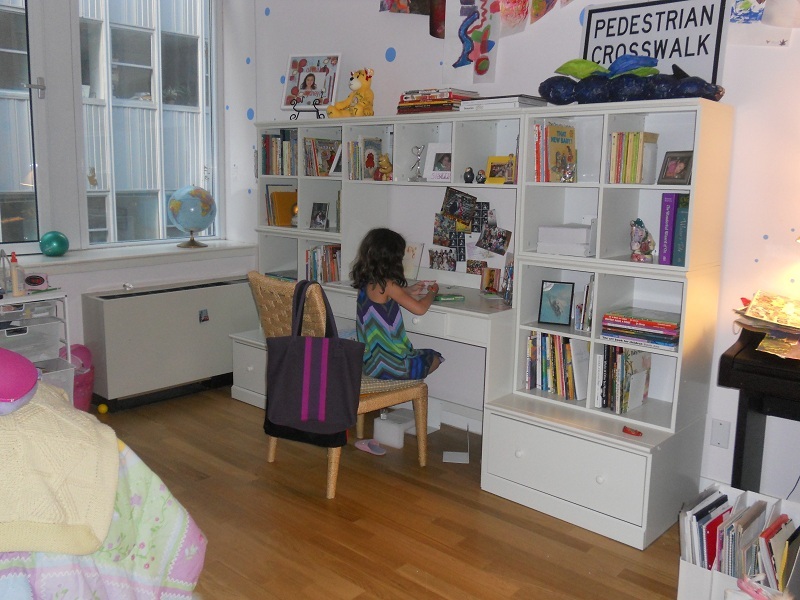 We hope you will like these tips to create a complete study area for your children. We want your comments and suggestions to promote our ideas. Thank you and have a nice day! You may also like to read Why Choose Canterbury to Study?